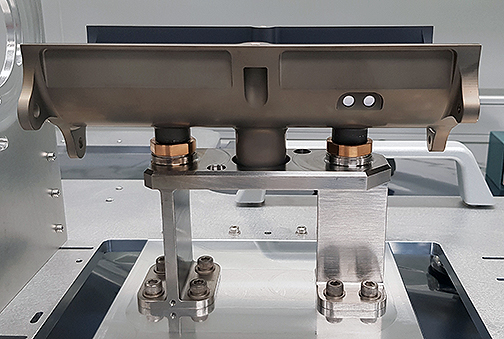 SENER and technology center IK4-TEKNIKER are collaborating in the development of PVD (Physical Vapor Deposition) coatings to provide additional functionalities for the surfaces of critical satellite components used in the Solar Orbiter, EXOMARS and JUICE missions of the European Space Agency (ESA). Image is courtesy of SENER and IK$-TEKNIKER. The medium gain antenna subsystem for the JUICE mission. Satellite mechanisms are fitted with many titanium parts that could tend to be welded together in the absence of a protective layer. To avoid this phenomenon, IK4-TEKNIKER has developed coatings to prevent metal-metal contact. More specifically, researchers at the technology center have developed coatings using PVD (Physical Vapor Deposition), a technology in which they have strong know-how and which allows superior properties measuring only a few microns or nanometers in thickness to be deposited on the surface. 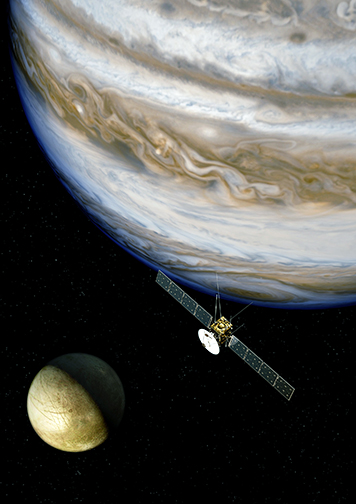 Artistic impression of the JUICE mission. These solutions have been validated by SENER for being applied in those satellites in which the engineering company develops components that could potentially suffer from cold welding, such as antennas equipped with deployable arms that must avoid this kind of welding to operate correctly. 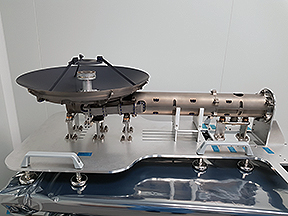 Therefore, IK4-TEKNIKER has provided coatings for parts that will be used on the Solar Orbiter (SolO) mission, for which SENER is in charge of the complete antenna subsystems - high, medium and low gain antennas (HGA, MGA and LGA); and on the JUICE mission to Jupiter, for which SENER develops the waveguides for the high together with medium gain antenna major assembly, both missions with significant technical challenges due to the environmental extremes. In addition, IK4-TEKNIKER has also collaborated with SENER on both ExoMars explorations on Mars to discover vestiges of life on the red planet, for which SENER has supplied technology for both the rovers’ structures and the scientific payload, among other components and systems. The SENER group has been, for more than 50 years, a top-tier supplier of electromechanical components and systems, navigation systems (GNC/AOCS), communications, astronomy and optics systems for Space, and it is currently participating in the main programs of ESA and NASA (including, in addition to those already mentioned, Hubble, Galileo, Rosetta, Gaia, Herschel and Planck, IXV, Proba 3, BepiColombo, Euclid Athena, LOP Gateway and Mars 2020) and of the European Southern Observatory (ESO). The group stands out as one of the leading suppliers for the ESA's science programs for its engineering contributions. IK4-TEKNIKER has been developing PVD coatings for 30 years. During this time, this research centre has developed thin films for various sectors and with different objectives: from tribological applications, reducing friction and wear in mechanical components, to complex optoelectronic devices, as electrochromic windows, photovoltaic cells or solar absorbers. IK4-TEKNIKER coatings laboratory is equipped with numerous PVD semi-industrial systems, which allow them to reach near to market solutions and process real components from their customers.